The problem is that Bloglines isn’t updating feeds from thousands of blogs, including this one (about a third of the feeds I follow have errors). This has been an ongoing problem. Meanwhile, those feeds are quite readable in other feed readers like Newsgator and Google Reader. The most recent TechCrunch post our 25,000+ Bloglines readers see is from May 14. 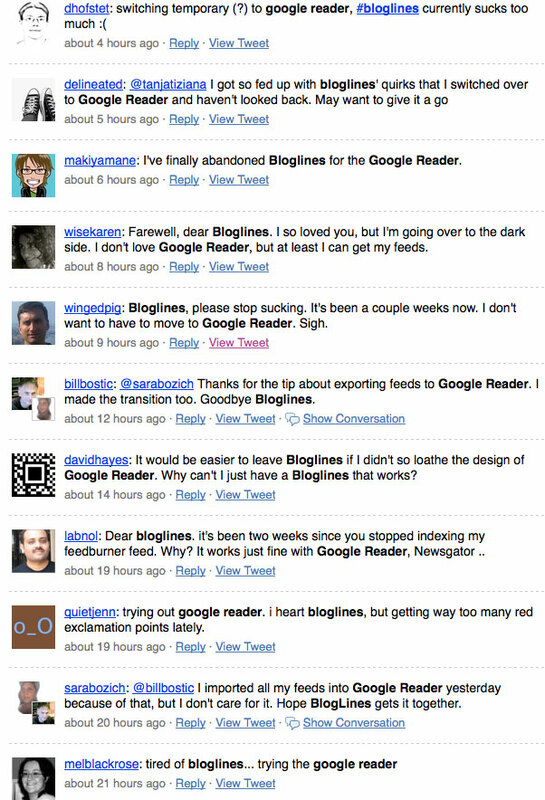 So what do you do if you are a Bloglines reader and ready to throw in the towel? Easy. Click the “Export Subscriptions” link on the bottom left of the page on Bloglines when you are signed in, and then import it into any feed reader you choose. Problem solved.